This bread is incredible. Eat some as a snack, use it to sandwich a chicken pesto panini, or use the recipe as a pizza dough. Love it. This is one of the recipes we made at my baking class this week. I’ll definitely be saving the recipe. Roughly combine (doesn’t need to be smooth) warm water, yeast, sugar, and 2 c. of flour to make a sponge. Let sit for 20-30 minutes. Add the 2 T. olive oil, salt, and gradually add the rest of the flour. Knead until smooth, about 5 minutes. You may not need to use all the flour. Keep adding the flour while kneading until the dough is slightly sticky, but doesn’t stick to the surface of your table or counter. Cover with plastic wrap or a towel and let rise till double in size, about 35-45 minutes. Drop dough into sheet pan and spread to the edges. Dimple the top with your fingers. Distribute olive oil and top with sage leaves and coarse salt. Bake at 400 degrees for about 25 minutes. Remove from sheet and cool on wire rack. 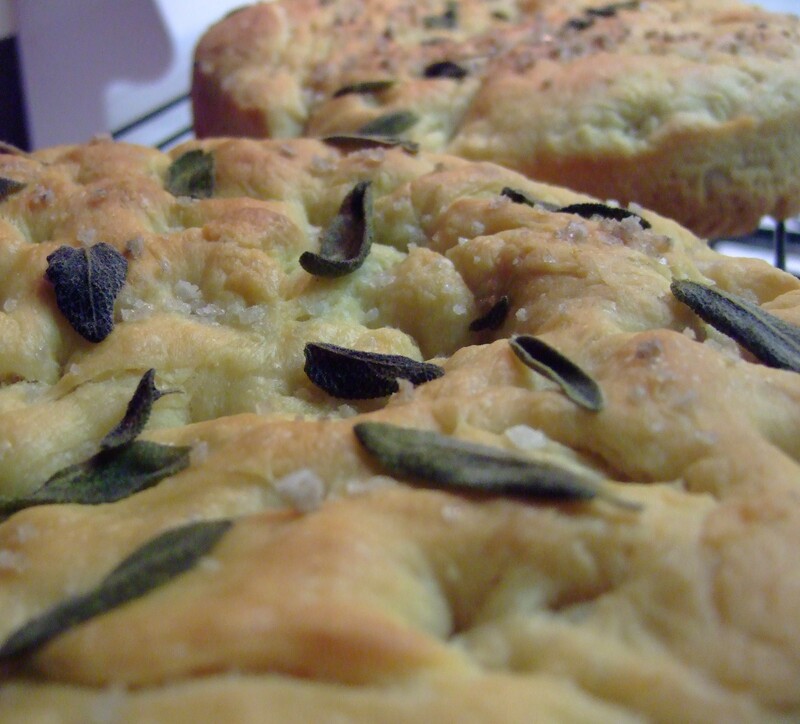 I LOVE focaccia. And sage… I think sage is such a comforting herb.